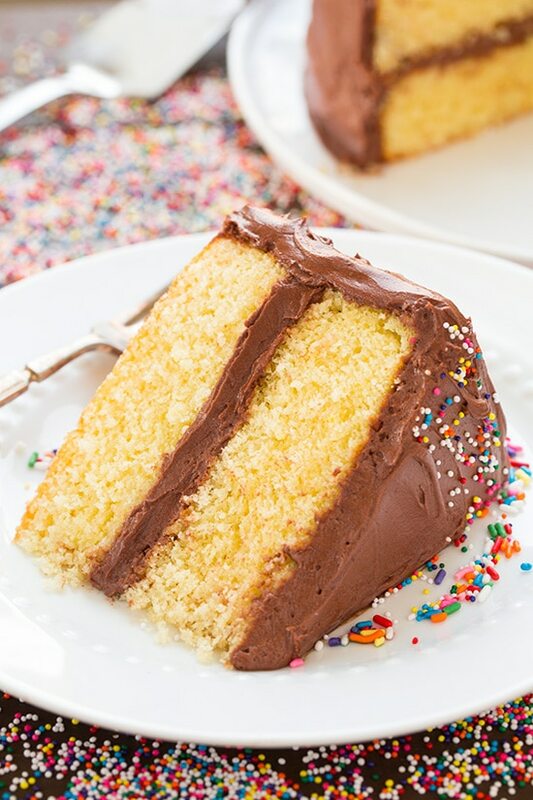 Yellow Cake is one of those classic recipes we should all know how to make from scratch. This cake is soft and moist, with the perfect combination of density and fluff to it. And when you top with with a rich, melt-in-your-mouth chocolate buttercream frosting, you know it’s got to be good! Once you begin making cakes from scratch, you’ll realized there’s definitely no need to return to a box mix. No question, they’re just so much better. They have more flavor, and I think they have a better texture too. Homemade cakes are much closer to (good) bakery quality cakes than the box mixes. I love making cakes, and of course I love eating them, especially this homemade yellow cake! It’s perfectly delicious! Have you noticed I can’t stop swirling batters and frostings? It’s my stress reliever :). They are just so pillowy, smooth and fluffy, so how do I resist? Preheat oven to 350 degrees F. Line pans, butter and dust with flour. Sift flours then whisk in add baking powder, baking soda and salt. In the bowl of an electric stand mixer fitted with the paddle attachment whip together butter and granulated sugar until pale and fluffy. Mix in eggs one at time then blend in egg yolks and vanilla. Mix in flour alternationg with buttermilk. Divide batter among prepared cake pans and bake until set. Cool in pans briefly, loosen from pans then invert onto wire rack to cool completely. Can I Turn This Yellow Cake Recipe Into Cupcakes? I haven’t tested this exact recipe as cupcakes before, but I’m sure that’d work fine! You’d likely need to bake the cupcakes for 18 – 22 minutes. Do I Have to Use a Blend of Flours? If you don’t bake a lot, I can understand why using both cake flour and all-purpose flour in this recipe may seem unnecessary. But trust me, you need the blend of flours to create a fluffy yellow cake! Can I Use Another Type of Frosting? Of course! 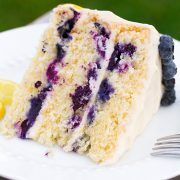 This yellow cake recipe would pair nicely with a classic buttercream, as well as a strawberry buttercream frosting. Or a different flavor entirely! 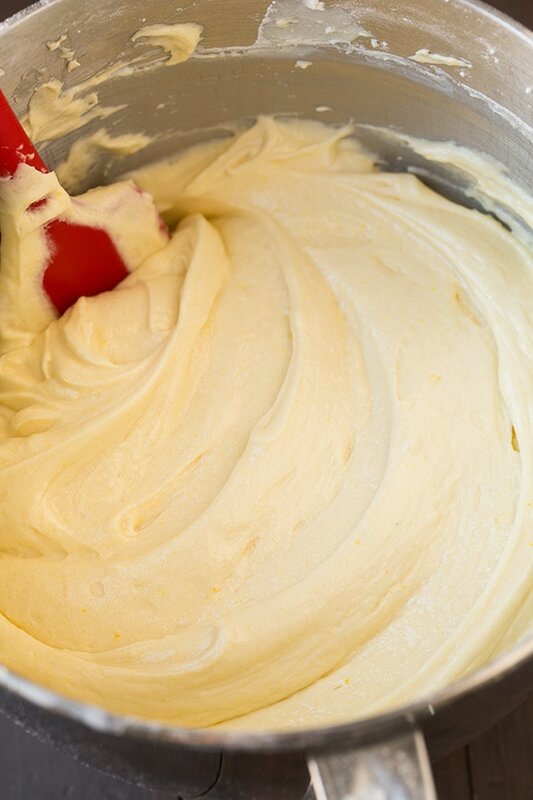 If you only have salted butter on hand, scale back the amount of salt you add to the cake batter. 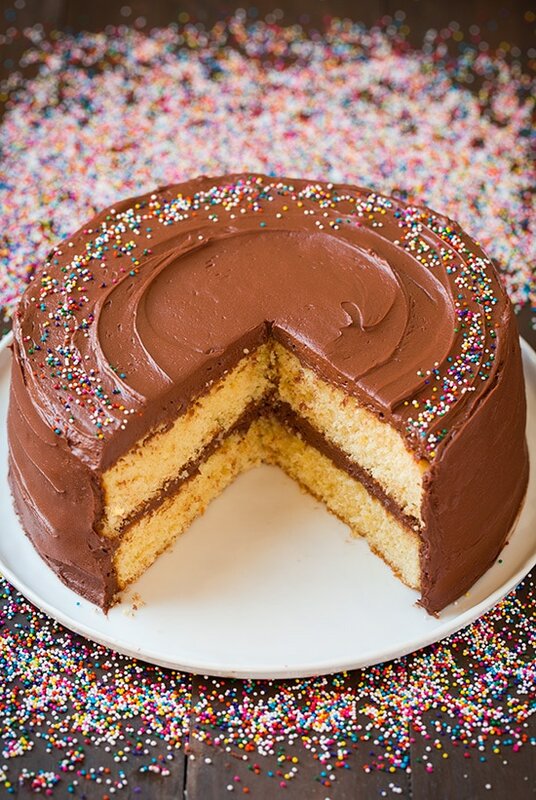 Let the yellow cake layers cool completely before topping them with chocolate frosting. Store this cake in an airtight container to keep it from drying out. This cake is soft and moist with the perfect combination of density and fluff to it, it's somewhere just between the two. 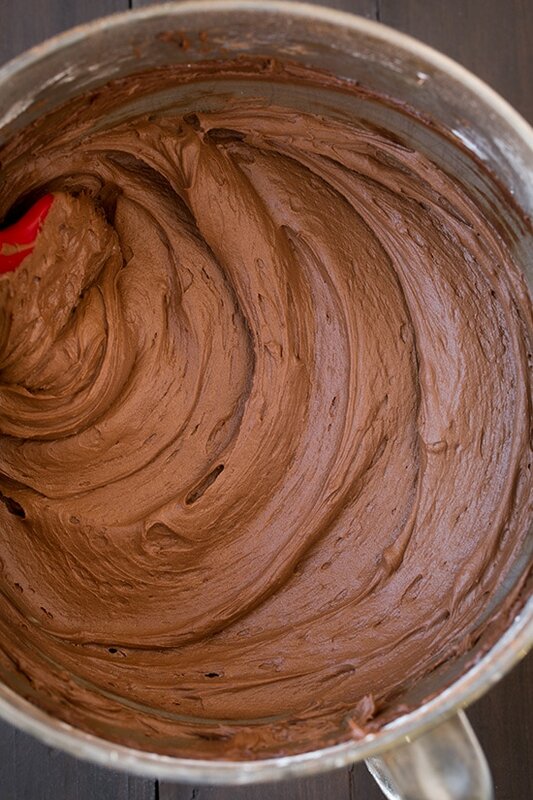 And when you top with with a rich, melt-in-your-mouth chocolate buttercream frosting you know it's got to be good! Preheat oven to 350 degrees. Butter 2 9-inch round baking pans, line with parchment paper and butter parchment. Lightly dust pans with flour and shake out excess, set pans aside. Sift all-purpose flour and cake flour into a mixing bowl. Add baking powder, baking soda and salt and whisk 20 seconds, set aside. 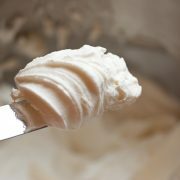 In the bowl of an electric stand mixer fitted with the paddle attachment whip together butter and granulated sugar until pale and fluffy (if not using a paddle attachment that constantly scrapes bowl, then stop mixer occasionally throughout entire mixing process and scrape down sides and bottom of bowl). Blend in vegetable oil. Mix in eggs one at time then blend in egg yolks. Mix in vanilla. Add in 1/3 of the flour mixture then mix just until combined, then add in 1/2 of the buttermilk and blend until combined, repeat process once more then finish by mixing in remaining 1/3 of the flour mixture. Scrape down sides and bottom of bowl with a rubber spatula. Divide batter among prepared cake pans. Bake in preheated oven 25 - 29 minutes until toothpick inserted into center comes out clean. Cool in pans several minutes, run knife around edge to make sure they are loose, then invert onto wire racks to cool (once halfway cool I recommend wrapping with plastic wrap until completely cool). Frost with chocolate buttercream once cool. Jaclyn: You should be able to just divide the batter among three pans and reduce bake time a bit. Layers will be thinner, or you could do 1 1/2 the recipe. 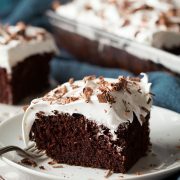 I tried this recipe today, and oh my GOD this cake and chocolate frosting is so delicious, thank you so much. I will treasured it forever :-). I made the cake. How do I insert a picture? I made a 3 layer cake. So, I made the two layers exactly as the recipe called for using 1/2 flour and 1/2 cake flour. Then I made another two layers using just the cake flour (Softasilk) which I normally use. I like using the cake flour. For me it came out just a little better, but your recipe was absolutely DELICIOUS. THE CAKE IS DELICIOUS and I just made the Icing and OMG!!! Cant wait to hear from my guest.